The relief from Eleusis. 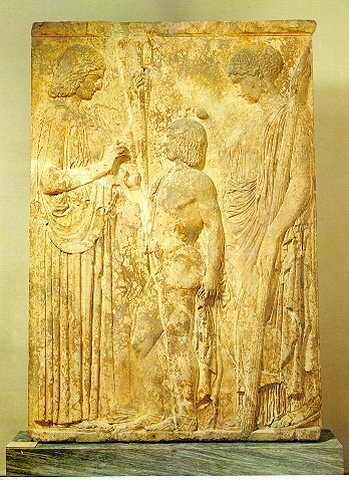 Large votive relief (h. 2.20 m.) with the representation of the Eleusinian deities. Persephone is depicted to the right, holding a torch and Demeter, on the left, offering the ears of corn to young Triptolemos, in order for him to teach to the world the cultivation of cereals. The relief was found at Eleusis and is dated to ca. 440-430 B.C. Inv. no. 126.